Do you like your food to taste really good? For example, after serving a potential partner a meal, do you want a marriage proposal? Well, I have the sauce for YOU. I am talking about hot sauce, baby. This stuff will make any dish have the zing of a restaurant meal without adding any calories. We all know that restaurants are famous for slathering on the butter (see: Grilled Salmon Fiasco), salt, and whatever else they can find to make you come back. I happen to believe that if you are smart about it, you can season food without hardly any calories and have it taste restaurant good. Chopped fresh herbs. I have a basil plant on my window sill because I am too lazy to go out into the yard to pick it. I find myself adding it to salsas, salads, sauces, etc. Fresh lime or lemon juice. I LOVE squeezing a lemon all over the place. Yes, it can be an expensive habit but the flavor is so much better than the bottled stuff. Hot sauce. Most hot sauces are less than 5 calories per TABLESPOON and you aren’t gonna use that much. My favorites are above - Tabasco, Chipotle Tabasco, Habanero Tabasco, and D’Elidas (someone sent me this one in the mail - thanks!). The grocery store is filled with all kinds of hot sauces from around the globe. Sriracha “Rooster Sauce” has been all over the cooking websites and I can find it in my local Stop & Shop. I put hot sauce in a lot of my food. I eat it in my beans and rice, eggs, currys, chili, potato salad, pasta sauce, oatmeal, tuna fish..... If I didn’t have kids that freak out at the sight of pepper, I would use it even more. For those of you who fear spice, there are a bunch of sauces on the milder side that will still add punch to your dish. Do you love hot sauce? Please share what you use and how you use it. Great post! I recently discovered the Chipoltle Tabasco (yum!) and was given some Siriracha sauce - good on brown rice with veggies! But, hot sauce on oatmeal, Snack Girl? Are you trying to make sure we're really reading? If you are watching your sodium intake, you need to be careful. Often times, they are loaded with salt, per tablespoon. Same with store bought salsa. My favorite one, On The Border, is about 140mg per TBSP. :-( My favorite hot sauce, Frank's, is 200mg per tsp. It is very easy to lather it on. A lot of people I know can't handle it,but I like ghost pepper hot sauce. 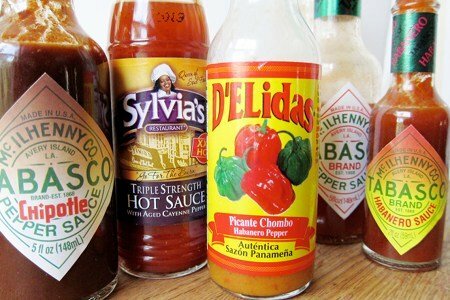 I usually find these in specialty hot sauce shops or at international markets and shops. It is way hotter than even habenero but t is so good if you have a high threshold to spicy hot food. Oatmeal, though... hmmm.. are you just being silly, or do you REALLY do that? I try my best to like oatmeal, but can only tolerate it once over a long period of time. perhaps you are on to something? Well, I used to (almost!) drink hot sauces of various types (salsa, too) and a few months ago, I saw a recommendation of a hot sauce from Trader Joes. It was very yummy, but when I read the label, I saw that it had xanthan gum in it. I didn't know what xanthan gum was (other than barely being pronounceable), so I checked it out. It looks like views on it are divided: one camp treats it (and a product with a similar function, guar gum) as no-big-deal and the other camp views it as a MSG-like compound which "can lead to the destruction of NMDA, quisqualate and kainate receptors in the brain." I don't know what any of those receptors are, but I do know that my reaction to stuff that has MSG-like substances (and the list is long, from what I'm told) in it is like that of an addict: I crave the food/sauce and find it very difficult to stop shoveling it in my mouth. Whether you steer clear of the xanthan/guar gum-containing sauces or not, I agree with Lisa -- these really can add a great amount of yumminess with almost no caloric cost. Sadly, I have developed allergic reactions to any kind of red pepper and also lime and lemon!!! Ugh! My husband goes through the Frank's Red Hot sauce like crazy, though. After my first trip to Mexico, I came back craving the fresh taste of their wonderful sauces and salsas. Fresh cilantro mixed into jarred salsa works, and I was pleased to discover that I can purchase "Cholula Sauce" at just about any grocery store -- even Christmas Tree Shoppe -- and there, at a great reduction in cost. I like that it's not too hot -- just the right amount of heat for my palate. We use Texas Pete, but I also like the Chipotle Tabasco (haven't seen it in stores, only in the Chipotle restaurants) and Frank's Red Hot. Sometimes we mix it with a little stir fry sauce, ketchup, barbecue, whatever depending on what we're eating, but we use it straight a lot too. I also put it in my chili, which elicits "Argh it's so hot but soooooo good" responses from my husband. I wish I liked hot sauce more. I always break into a sweat even with the mild ones. I definitely use your suggestions on lots of herbs and fresh lemon and lime juice. I also seems to use a lot of vinegar especially red wine vinegar. Obsessed with it. Oatmeal can be a savory dish too. Add scallions, soy sauce, roasted cashews, and a dash of hot sauce - does that sound good to you? LOVE hot sauce. But yes, sodium can be a killer - and some are not calorie-free (but usually still have few cals - just be aware if you're watching cals.). And re oatmeal - I thought "ah, I knew I liked Snack Girl!" when I read that - I make savory oatmeal now and then - with a fried egg on top and hot sauce rocks on that! I love siracha! I use it on top of omlettes and find I don't even need the cheese inside anymore. I also use it in tuna, salmon patties, stir frys, cold peanut sesame noodles, and pasta sauce! Ok, I just have to add my family's favorite hot sauce since I don't see it mentioned here. We love all the varieties of The Pepper Plant brand hot sauces. Even my teenage girls who hate any kind of fresh peppers like this sauce :) I agree with you Lisa, hot sauce is awesome - just a dash takes a plain bowl of steamed cabbage from blah to yum! Love Hot Sauce on everything. Just had some eggs & black beans with a hint of tabasco! Yum! Have to agree on the Sriracha “Rooster Sauce”! I don't like hot sauce but I do like eggs with cocktail sauce! That was the right amount of kick for me! My all time favourite is Tabasco Jalapeño Sauce. Milder but still super tasty. Great on oysters! !